Just making a decision can be hard enough, but how do you begin to judge whether it's the right one? Chip and Dan Heath, authors of #1 New York Times best-seller Switch, show you how to overcome your brain's natural shortcomings. In Decisive, Chip and Dan Heath draw on decades of psychological research to explain why we so often get it very badly wrong - why our supposedly rational brains are frequently tripped up by powerful biases and wishful thinking. At the same time they demonstrate how relatively easy it is to avoid the pitfalls and find the best answers, offering four simple principles that we can all learn and follow. In the process, they show why it is that experts frequently make mistakes. They demonstrate the perils of getting trapped in a narrow decision frame. And they explore people's tendency to be over-confident about how their choices will unfold. Drawing on case studies as diverse as the downfall of Kodak and the inspiring account of a cancer survivor, they offer both a fascinating tour through the workings of our minds and an invaluable guide to making smarter decisions. Winner in the Practical Manager category of the CMI Management Book of the Year awards 2014. "A leader's most important job is to make good decisions, which--minus perfect knowledge of the future--is tough to do consistently...The Heath brothers explain how to navigate the land mines laid by our irrational brains and improve our chances of good outcomes." -Inc. Fantastic book. Very actionable lessons and useful anecdotes and statistics which wholly support their recommendations. 4.0 out of 5 starsStrong evergreen advice on how to make better decisions amidst many, many stories. The reason why you need to read a book on how to make better decisions is because, based on cognitive research, human beings are wired to make less-than-wise decisions. Science has shown that the formulas our brains use to decide simplify things, but the mental shortcuts often are not in our best interests. Cognizant of this, the questions then becomes: How do we overcome these innate predilections and decide better? Decisive illustrates four specific strategies. The four strategies are W.R.A.P. : Widen Your Options, Reality Test Your Assumptions, Attain Distance Before Deciding and Prepare to Be Wrong. The book proceeds linearly through W.R.A.P. and each section goes into detail about how a specific strategy can help you to decide better. Furthermore, within each section, sub-strategies are detailed that explain the critical building blocks you will need when deciding. Also located throughout Decisive are ‘clinics’ that pose a question and invite you to apply what you’ve learned to a case study. For those who just want to get straight to the point, each chapter ends with a one-page summary of bullet points. The only negative comment I have about this book is that it is told through many, many stories. Decisive is a non-fiction book but at times it feels like you are reading a fiction novel about a series of characters who had to navigate through tough scenarios. It’s understandable why the authors did this (because stories are memorable, impart knowledge and inspire to act), but it felt as if they went overboard at times. The hardcover is 300 pages and I would presume over 100 of those pages consist of the stories alone. Essentially, reading all three will show you how to develop a lasting idea that people will believe in, care for, and take action on (Made to Stick); how to materialize that idea into transformative change (Switch); and how to navigate along the path you have chosen in your personal life and job (Decisive). Chip and Dan Heath open their book, Decisive: How to Make Better Choices in Life and Work describing a woman considering whether to fire her firm’s IT Director. They ask you to reflect on your mental activity as you read their description. Next, they tell you what you probably did. They nailed that part for me. Finally, they show you why what you did, and what most people do, may not lead result in good decisions. Here’s a summary of the book’s subject in two quotes from the introduction. 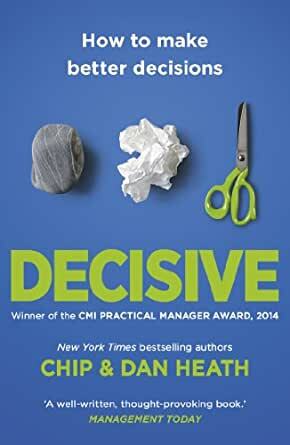 Decisive describes how you can make better decisions by following a simple process. The Heaths share research that shows that process is more important than analysis when reaching effective decisions. In fact, a good process can lead to better analysis. They describe what they call the four villains of decision-making. The villains are: narrow framing, confirmation bias, short-term emotion, and overconfidence. They share a four-step process you can use to lessen the effect of the four villains. I like the simple process represented with a few letters. The military does the best job I know of in teaching people how to decide. One key to their method is to define a simple process for analyzing an issue. The Army uses an analysis tool called METT-TC. That stands for: Mission, Enemy, Troops available, Terrain, Time, and Civilian concerns. The simple process helps a decision maker consider all the important factors. Each of those elements of their process gets several chapters’ worth of coverage. The authors illustrate their points with relevant, well-told business stories, some of which you probably haven’t heard before. The Heaths also introduce several tools you can use to make the process work better. I found tools I was already familiar with, such as pre-mortem. There were tools I knew about but which had slipped away from the front of my memory. An example is Suzy Welch’s 10/10/10. And there were tools I never heard about such as book-ending. Decisive: How to Make Better Choices in Life and Work is one of the best books I’ve read on decision-making. The Heaths created a simple process with an acronym to help you remember it. Then they present an array of tools to help you make the process work. If you want to improve your decision-making, or even if you think you don’t need to, this book is a must-read. I'm a disaster at decision-making, so this book was really helpful. The most surprising part was the idea that if you're wrestling with a decision between two options, do both! Eventually one of them will fall by the wayside, if necessary. I've already used this idea and it worked out flawlessly, with no endless agonizing necessary. Since I'm not an executive, the business-related stuff was less helpful, and there are so many ideas in there that I'm not totally sure how best to apply them all, but it's an easy read with a lot of helpful ideas supposedly backed by research.